William Thomas Murray, Billy Murray, was born in Philadelphia on May 25, 1877. His parents had migrated to the US from County Kerry, Ireland as young adults and in 1883 the family relocated to Denver, Colorado. Murray joined the Harry Leaviitt’s High Rollers troupe as an actor in 1893 and spent the next ten years honing his skills as an MC and song and dance man for a succession of minstrel shows and vaudeville troupes. In 1897, Murray traveled to San Francisco with aims at securing a job as a phonograph artist for Edison cylinders. He began recording songs for Edison in a variety of styles including sentimental ballads, religious standards and other popular styles. In 1889, he joined the Al G. Field Minstrels as a blackface singer and eccentric dancer traveling to the East Coast. Arriving in New York, Murray and songwriter Paul Dresser began plugging songs to phonograph companies. He quickly distinguished himself as a versatile interpreter of many genres. Journalist Jim Walsh would later write in the Hobbies magazine that ‘Billy Murray’s records were the only ones so clear you could catch every word on first hearing. This was partly because there was a certain ‘ping’ to his voice that cut sharp into the wax and he was smart enough to nasalize certain syllables to make important words and phrases stand out.’ Murray secured solo recording deals with Edison and Victor Records and from 1903 to the mid 1920’s released a string of recordings that hit #1 on the charts including Bedelia, Navajo, Meet Me In St. Louis Louis, Alexander, Come Take a Trip in My Air-Ship, Yankee Doodle Boy, Give My Regards to Broadway, In My Merry Oldsmobile and Everybody Works But Father, The Grand Old Rag, Harrigan, Under Any Old Flag At All, Carrie (Carrie Marry Harry), I Love a Piano, Pretty Baby, and That Old Gang of Mine. To avoid a saturation of solo recordings, Murray was teamed with other best selling artists including Bob Roberts and Len Spencer. His most success pairing, however, was with the premier female singer of the day, Ada Jones. He also collaborated with vocal groups including Haydn Quartet, the American Quartet, Peerless Quartet, the Heidelberg Quintet, and the Eight Famous Victor Artists. With his collaborators, Murray had #1 hits with Take Me Out to the Ball Game (1908), By the Light of the Silvery Moon (1910), Let’s Take an Old Fashioned Walk (1907), Wouldn’t You Like to Have Me For A Sweetheart and When We are M-A-Double-R-I-E-D (1908), Shine on Harvest Moon (1909), Be My Little Baby Bumble Bee (1912), You’re the Flower of My Heart, Sweet Adeline (1904), Let Me Call You Sweetheart (1911), I Didn’t Raise My Boy to Be A Soldier (1915), My Bird of Paradise and The Lights of My Home Town (1916), I Don’t Know Where I’m Going But I’m On My Way (1918), Because (1900), In the Good Old Summer Time (1903), Toyland (1904), Blue Bell (1904), Dearie (1905), How’d You Like to Spoon With Me (1906), Sun bonnet Sue (1908), Put On Your Old Gray Bonnet (1909), Casey Jones (1910), Call Me Up Some Rainy Afternoon (1910), Oh You Beautiful Doll (1911), Moonlight Bay (1912), Everybody Two Step (1912), Rebecca of Sunnybrook Farm (1914), It’s a Long, Long Way To Tipperary (1914), Chinatown, My Chinatown (1915), Oh Johnny, Oh Johnny, Oh! (1917), Over There (1917), Goodbye Broadway, Hello France (1917) and Waiting for the Robert E. Lee (1912). By the 1920’s, Murray was still successful despite the changing style and sound in American popular music. 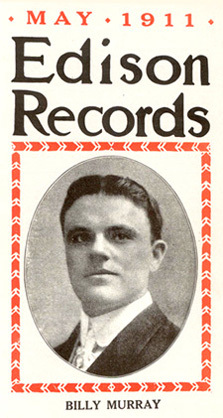 He continued recording for the major record labels of the time as a solo artist and in new duet pairings with Ed Smalle and Aileen Stanley and Walter Scanlan. In the 1930’s, Jim Walsh noted “He sang old-time popular songs for the movies in such productions as the ‘Bouncing Ball’ comedies. He even imitated animals for the talking and became well known as a radio actor, playing character parts in the Parket Family series and other popular shows. Murray continued recording into the 1940’s with his last recording, the comic dialogue ‘Casey and Cohen in the Army’ being released in 1943. Murry was a devoted baseball fan and he is said to have played with the New York Highlanders (Yankees) in exhibition games. He also supposedly sometimes called in sick to recording sessions in order to go to the ballpark. With the onset of heart trouble, Murray retired in 1944. He died on August 7, 1954. To listen to great recordings by Billy Murray and other early recording artists visit the Cylinder Preservation and Digitization Project at the University of California at Santa Barbara.